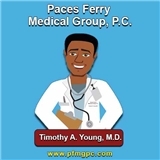 Paces Ferry Medical Group, P.C. (Atlanta) - Book Appointment Online! We make every effort to comfort, to learn, to heal and to seek the knowledge to promote health and prevent disease. Our patients are at the center of everything we do. We commit ourselves to furthering our rich tradition of health care leadership, charity and the highest standard of care to our community. It was really good. I had a lapse in insurance but I am back now.